The table saw is one of the most widely used tools in the wood shop. It consists of a circular saw blade that protrudes up, through the flat surface of the table base, so as to provide a smooth surface for the saw blade to cut through wood. The table saw can also be one of the most dangerous of the tools in a woodworking shop. There are more injuries of a serious or debilitating nature from the table saw, than any other power tool in a woodworking setting. It is important to always wear eye protection such as safety glasses or goggles, because of the possibility of small pieces of wood that can travel at high speeds through the air. Loose fitting clothing can be very hazardous as well. Neckties and jewelry can also be a safety problem because of their propensity to possibly get caught in the saw blade. First of all, before getting started in using the saw you should keep the area clear of any loose stock, excess sawdust, cutoffs, and other miscellaneous materials. These types of materials can easily get caught in the saw blade or get in the way, or cause a problem in getting smooth and clean cuts. A loose or errant piece of wood can become a dangerous projectile that can cause serious injury if it gets caught or jammed in the blade area. You should always check out the safety features of the saw to be sure that they are properly set and operating as they are designed. The guard for the saw blade, the riving knife, and the anti-kickback protective device should all be properly set and adjusted prior to the turning on of the power. These devices are simply there to protect the user from injury, and you should pay attention and know exactly how to set them up. When you are going to be cutting large items such as a full sheet of plywood, or a large piece of lumber, such as a 4 X 4 piece of lumber, set up your job properly. Be sure to set up an out feed platform or table to help support the item as it comes through the process. Sometimes it is a good idea to enlist a helper to assist in guiding the item in a more stable manner as it comes through the process. 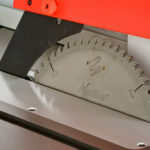 Another good safety tip to remember is to always disconnect the power to the saw whenever you change the blade to the saw. You certainly do not want the power to accidentally be turned on while you are changing the blade. Now, when you are getting ready to actually start the saw, you should be sure that the blade of the saw is freely spinning, and not touching or engaged with the lumber you are about to cut. When you turn on the saw, you need to allow the blade to achieve full speed before you start cutting into the wood. This will keep the wood from getting caught and jamming or jumping into you as it starts up being cut. Your stance in relation to the table saw is very important for your safety. Plant both feet on the ground, and stand to the side of the direction of the saw cut. Standing directly in front of the blade can severely injure a person if the stock kicks or jams, as it will be flung right into you like a missile. Always be sure to unplug the power to the saw prior to ever making any adjustment to the blade or fence. Be sure that the blade is not moving either, even at idle before you make the adjustments. Always be sure to use the correct zero-clearance blade inserts. Without these protective devices, a loose piece of wood could fall into the saw cabinet and become a projectile and injure you. Never, never attempt to do a free-hand cut on a piece of lumber. Always use a miter gauge or a fence to help you to guide the the lumber through the cut. Never use the miter gauge and the fence together, because the end of a piece of lumber can sometimes can get wedged against the fence. It is also very wise to thoroughly check the lumber for any nails, screws, staples or other foreign objects, or even a loose knot on the lumber that could break loose and become a flying object. If you can run a metal detector down the side of the wood, you can detect any hidden metal fasteners that might be a problem. Always use a wooden stick to push the lumber through the blade and you will save your fingers from getting too close to the spinning blade. These are all common sense preventative measures, but as simple as they are, many users forget and are injured by not following them. For our table saw reviews click here.